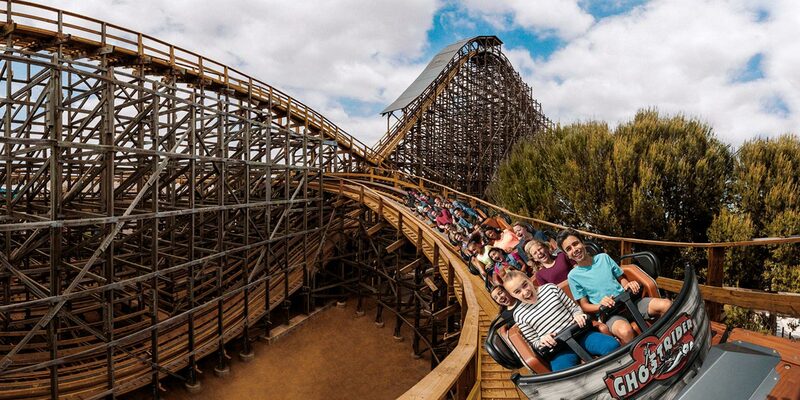 GhostRider is the longest, tallest, and fastest wooden roller coaster on the West Coast! Looming 118 feet over historic Ghost Town, GhostRider is the largest attraction at Knott’s Berry Farm and one of the longest and tallest wooden roller coasters in the world. Brave riders enter a mysterious mine and board gold, silver or copper mining car before being sent galloping along over 4,500 feet of twisting timber. The massive roller coaster includes 14 hills providing tons of air time throughout the nearly three minute journey. For the ultimate thrill, take a ride at night when every twist and turn is hidden in darkness. GhostRider has been routinely featured on the lists of the best wooden coasters in the entire world since opening in 1998. In late 2015 through spring 2016, a complete track refurbishment was performed on the ride creating an improved ride experience with a smoother track and new trains.